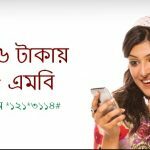 Welcome to all Grameenphone customers to activate special GP 19Tk Scratch Card 100MB Internet Offer. GP has announced to their customers to activate special internet offer to 19Tk scratch card recharge offer. The GP customers who want to enjoy GP internet offer with low price. No tension, GP has come for you to activate 100MB Internet only 19Tk offer. If you want to activate this offer, just read this full article to get all more update about this offer and follow our all instructions. In this bellow, we will share all more update information about How to activate GP 100MB internet offer. GP all selected customers are eligible to activate 10MB internet only 19Tk scratch card recharge offer. To activate this special internet offer, customers need to recharge 19Tk scratch card. First you may dial *555* Hidden Number Of you Scratch Card#, then press to send button. After recharge this fix amount, customers will get 100MB internet. Validity internet balance in 3 days. We hope all prepaid customers are eligible to activate GP 19Tk Scratch Card 100MB Internet Offer. If you want to know more about the all SIM offer, please comment our Facebook Page. Thanks for being with us.